Recently, I tried out a piece from the jewelry store, Shadora. This jewelry store showcases simple, elegant pieces for only 30 days at great, discounted prices. Once that cycle is up, a new set of deals go up. I don't have to tell you they go fast. The PR of Shadora inquired what my sizes were. I said I had a thick wrist and needed something that was 8-9 inches, and I was sent this bracelet for review. This bracelet came in a pretty Shadora branded box. It features large, shiny glass beads, in a lovely shade of pink, secured together by pink thread. The beads have a kind of marbleized design throughout. I find it an ethereal, very feminine look. I love the color. However, I'm not a huge fan of big beads and threaded jewelry. At least not since my teen years, but the nice part about this bracelet is that it's adjustable. I have thicker wrists, and it's hard to find decent bracelets that fit them right. Though I would have loved to model one of their pendants or something that better showcases the majority of what they sell, i'm not terribly un-pleased, as I can give this as a gift to someone much younger. I do hope to show you some nicer sterling silver in the future. Afterall, that is what they are known for. You can learn more and see their collection at Shadora. I'm not a huge fan of string bound jewelry. I hope they offer your more of their sterling type stuff in the future as I would like to see what that is like. Yeah, I would have loved to model that pendant pictured! The bracelet just seems cheap. I think it would be good for a child maybe. This so cute. My daughter would totally love this. Thank you for sharing! I agree with Kelly...while it is a cute bracelet if this is the best they have to share for a review I will most likely pass their site over...i do not even buy my kids costume jewelry.I feel you wrote a lovely piece for a less than stellar product. GREAT REVIEW...and shame on shadora!! Yeah I mean the blog is great and she did a great job describing but seriously shame on them for giving her crappy jewelry to represent their brand. This is a cute bracelet. These types of bracelets seem to be very popular right now- i see tons of them at the mall being sold at kiosks. I think it is cute. However, I typically do not wear string jewelry. Great review on this product. I think the bracelet is pretty but is it bulky? I think it is a nice gift for you younger person. Great review! The bracelet is a little too chunky for my liking but the pendant you showed was really cute. I think the bracelet is cute! But it seems more like what my daughters would want to wear. My birthday is coming up -wink wink- I'm going to ask for that necklace! Its cute but looks kinda bulky and more for teens.. Its pretty though! I think the string makes the bracelet more stylish for day wear. I like it. Without the string would make it look more formal and wouldn't work with a day outfit that well. Great write up that gave me all I need to know about the quality of the products. LOVE the necklace pic! 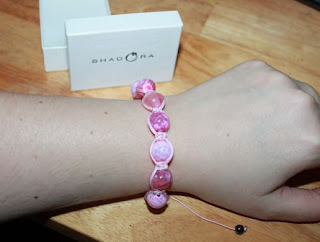 While I am not crazy about the bracelet, I have purchased jewelry from a company that features Shadora and I have not been unhappy once with the jewelry I have received. But keep in mind you get what you pay for, I got semi precious gemstone earrings for 2.99 and they are lovely, however the settings are thinner then if I would have paid more.